Garnet black color. Herbal aromas and flavors of black plum, eucalyptus, kaffir lime leaf, dried rose, and blackberry coulis with a silky, vibrant, dry-yet-fruity medium body and a silky, medium-length finish imparting accents of cherry cola with crunchy tannins and moderate oak flavor. A solid Aussie cabernet that will be a natural with lamb. Bottom Line: A solid Aussie cabernet that will be a natural with lamb. 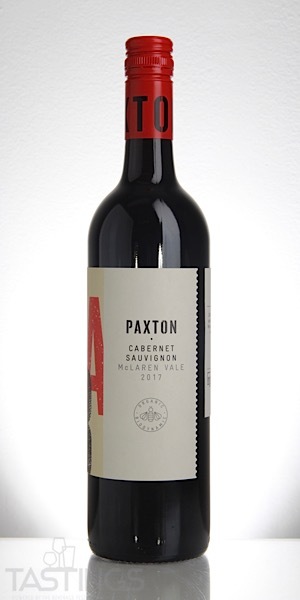 Paxton 2017 Cabernet Sauvignon, McLaren Vale rating was calculated by tastings.com to be 92 points out of 100 on 10/26/2018. Please note that MSRP may have changed since the date of our review.